On November 1st I got a very nice surprise in my inbox from Microsoft. I was being awarded an MVP in the ‘Visual Studio and Development Technologies’ category. This is an achievement that I am extremely proud of and very excited about. It’s an honour and honestly quite daunting to join such an amazing group of talented community leaders and experts. A few people have since asked me about the process of becoming and MVP so I thought it might be helpful to share my experience here. Before diving into the specifics of the MVP process I thought it would be worth giving a little background of my career. I’ll try to keep this short by skipping to the salient points, however I think it’s helpful to share a little of my background, which has not always been in development. I’ve worked in the IT industry since around 2000/2001 when I got my first job as a desktop technician for the NHS in my college (high school) holidays. Even before that I was “into computers”, building my own PC from components ordered online and dabbling in programming with QuickBasic and later VB6. I continued my IT career with a job as a desktop and server engineer for a manufacturing company. Whilst doing that role I suggested building an intranet for some of the internal documentation. I had some limited self-taught experience with HTML at the time so I learned what I could from books and online. Later I taught myself classic ASP in order to build a spare parts ordering system for use within the manufacturing company and its partners. Then ASP.NET was released and I started playing around and learning to work with that from books and online articles. Around the ASP.NET 2.0 timeframe my employer needed to improve an in-house Access database system for managing hydraulic test results for their products. I rebuilt that system using SQL Server with a web (WebForms) frontend. I think at this point I was still using VB.NET! Later my role was outsourced and I was transferred to work for the outsource provider. There I continued as a desktop and server engineer but due to the stricter role boundaries I was no longer able to perform any development work. I kept my skills up with my own side projects, focusing on the current releases of ASP.NET at the time and starting to teach myself C#. I also took on a little bit of side work producing a bespoke website and CRM for a consulting firm in my own time. I developed my career at the outsource provider over the years there, becoming a UK engineer lead and eventually moving into a role as a Service Delivery Executive, managing support in Europe and Africa for one of our large customers. This was a move away from the technical aspects and into management and customer relations. I enjoyed the challenges but as time went on the resources were stretched and the role became extremely stressful and unrewarding. I stopped enjoying what I was doing and found the 50+ hour work week was absorbing any spare time I had to relax and dabble with development. I decided to make a change. I realised I was enjoying the experience of building sites with ASP.NET and learning as much as possible and so I applied for a few developer roles. I was very conscious that I had no idea how my self-taught developer skills would stack up in the real world. However I interviewed for Madgex (my current employer) who clearly found my answers suitable as I was offered a job there! I started at the level of “developer”, so between junior and senior. This reflected fairly my skill level at the time. I immediately loved the role and found my days were far more enjoyable. I was no longer stressed and was able to enjoy having some proper free time outside of work. It was a change in direction that I am very pleased I made. I have now worked at Madgex for over 2 years and in that time have been constantly learning. For sure there was some elements of my developer skill set that were lacking, having been self-taught, but I quickly worked to fill those gaps in my knowledge. The team I joined was amazing and I learned so much from the experienced developers there. In my personal time I spent a lot of the free time I had learning more, watching videos and keeping up with the developments around the new ASP.NET Core framework. About a year or so ago I was lucky enough to be able to put that into practice as we started developing a new product at Madgex. I’ve since been promoted to senior developer and within the last month taken on some additional responsibilities as a developer community lead. The journey to becoming an MVP begins with a nomination at https://mvp.microsoft.com/. In my case I received my first nomination in January 2017 from MVP James Chambers whom I had worked with quite closely on the Humanitarian Toolbox allReady project. 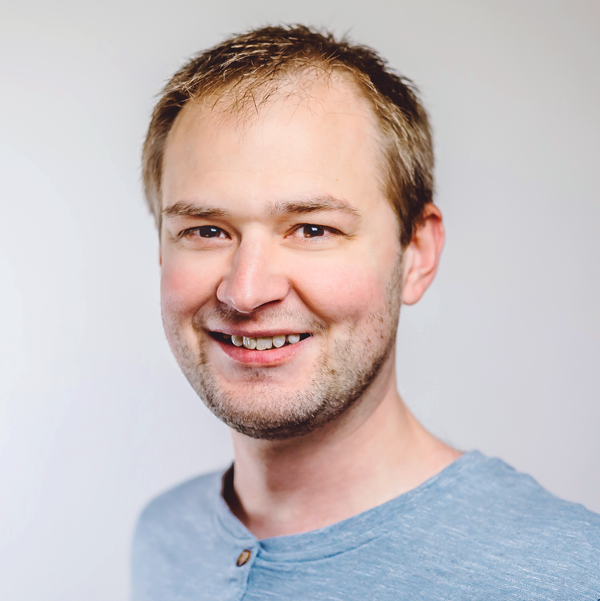 James was aware of my blog and activities contributing to OSS and felt I should be put forward for the MVP. As a nominee, the first you hear about this is via an email from Microsoft, stating that you’ve been nominated. You are given a link to complete a profile in their system. As part of the profile completion process you are asked to provide a detailed list of your community contributions. This includes things like any events you have spoken at, blogging, videos you’ve shared and OSS contributions. Retrospectively working out what I’d done and when was no easy task. Had I been expecting a nomination it would have been helpful for me to have kept a record for the last year of activities. If you’re involved in community and hope to one day be nominated I would recommend that you keep a list of key dates for your community activities. Once you have completed your profile and contributions you submit the form and get a confirmation email that it will go into a review process at Microsoft. In my case, after completing my profile it was a long wait before anything happened, many months in fact. During that time I assumed that the nomination and profile must be under scrutiny within Microsoft. Every now and again I went in to update the contributions against my profile. The process is a bit of a black box and I’m not really sure if my nomination was forgotten about or that it simply takes some time to get a response. In August I happened to be at a Microsoft community event being run by the the UK Community Program Manager / MVP Lead, Claire Smyth. Since I had the opportunity I asked about the MVP process and mentioned my nomination. We followed up by email and Claire was able to locate the nomination in the system. At this point we arranged a brief call to discuss the MVP along with support Microsoft were offering to new user groups. I happened to have just setup my new user group, .NET South East at this time so Claire had kindly offered me some support and advice. This was a useful chat and Claire was able to explain a little more about the things that the MVP team are looking for in nominees. It’s mostly that there is a varied and comprehensive range of contributions that show a positive community benefit. I was able to discuss my community activities in a little more detail. Claire also explained that after the nomination is approved it usually also goes to the respective product teams for them to review the contributions and give their feedback. In my case I’d had a little contact with some of the ASP.NET team and I let Claire know some of the people I’d previously interacted with. At the end of the call Claire confirmed she would look over the information and see if the nomination should go forward. 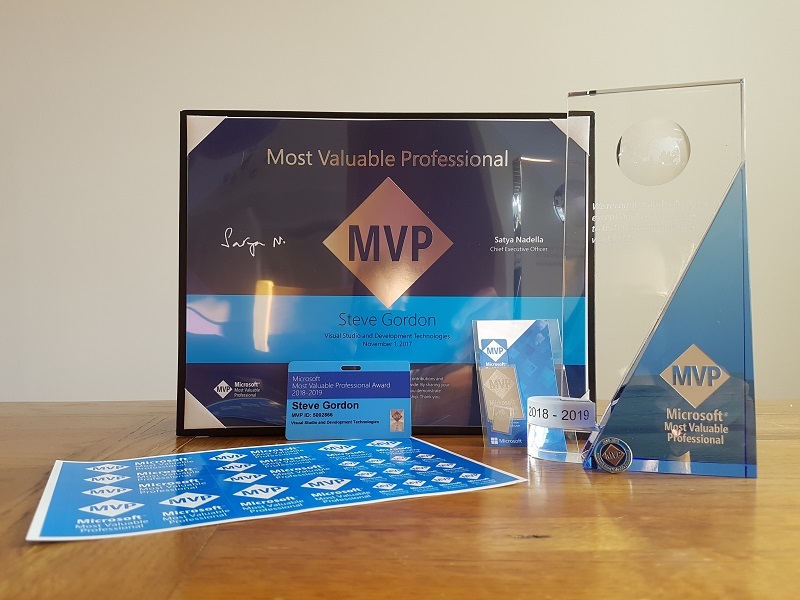 During the weeks after our call I was fortunate enough to receive two further nominations for the MVP award, including one from Jon Galloway at Microsoft. This last one I feel had particular weight in tipping me over to get the award. Since the review process includes some input from the product teams as to which nominees are ready to the award, having a nomination from someone on the ASP.NET team was likely very helpful! If you receive additional nominations you seem to get a whole new profile to be completed. I dropped an email to Claire who I believe was able to link the nominations together in the system. Just to be sure, I completed the profile on the most recent nomination link. By this point I’d done some more talks so I was able to add some extra contributions to my list. After this, things went quiet again while the process continued behind the scenes. It was a busy period and I forgot mostly about the nominations for a while. Then, on the 1st of November after an evening meal with some friends I happened to glance at my phone when heading to the car. I had a few emails and I scanned over the list. 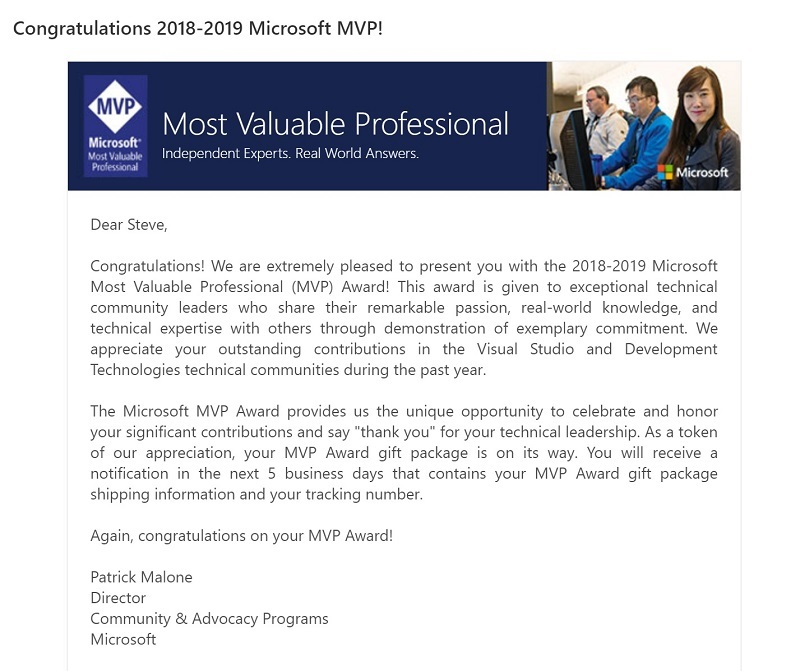 One particular subject line jumped out at me – “Congratulations 2018-2019 Microsoft MVP!” My excitement mounted further as I opened the email and read the first paragraph! I was honestly shocked and very excited to read this email. I immediately showed it to my wife who was also very excited. I’d explained the MVP and mentioned my nominations for it to her earlier in the year and she was aware of what a big thing it was to be awarded the MVP. In the congratulations email you are sent details of how to start accessing some of your MVP benefits via the MVP site. There’s a lot to take in. I started by ensuring my MVP profile was correct so that it would appear on the MVP site. I then looked at things such as the MSDN Visual Studio Enterprise subscription which is a very handy subscription to get! After agreeing to a Microsoft NDA you are also able to access special mailing lists that include members of the product teams. I joined the ASP.NET mailing list and the Azure one as those are most relevant to what I do day to day. You can also sign up for a Microsoft Yammer group that gives you access to chat with other MVPs and Microsoft personnel. There’s still lots of things I need to look into as MVP have access to various licenses and products as part of their benefit package. For me though, the access to the wider product teams and fellow MVPs is one of the best benefits. As well as the access and licenses mentioned above the other thing you can expect as a new MVP is an award pack posted to you from Microsoft. I got an email stating that mine had been posted and would be with me in about one week. I’d seen photographs of the award pack from other MVPs via Twitter so knew roughly what to expect. Even so, on the day of its arrival to my home it was exciting to unbox the contents. Inside the award pack you get a very solid physical trophy made of glass. It’s much more substantial than I’d expected and looks really great. You also get a certificate, MVP ID card, lapel pin and some MVP stickers. It’s a really nice pack and it’s nice to have something physical to represent the award. The other very exciting opportunity for MVPs is the chance to register to attend the MVP Global Summit which is run annually out of the Microsoft campus in Redmond, Seattle. My MVP award was perfectly timed, just before the registration for this event opened. On the day of registration I was eager to sign up to attend. It’s a hugely valuable opportunity to visit the Microsoft campus and to meet and interact with the Microsoft product teams directly. The registration process itself was a bit of a nightmare as despite jumping on the minute it opened, the system was clearly unable to handle the load and was crashing. I spent nearly two hours trying to complete the hotel registration phase. During that time a number of MVPs were experiencing problems and tweeting about the issue. One MVP provided a couple of phone numbers we could try to get support. Not surprisingly the phone system also struggled under the load but eventually I was able to get through to someone. They were very helpful and in very little time managed to get me registered for the event and the hotel of my choice. I’m looking forward to my first trip to the US and the chance to meet many of the MVPs and Microsoft staff I follow on Twitter. Being awarded the MVP is a very exciting development in my career. Over the last two years I have been very focused on blogging and sharing as much as I can with the amazing developer community. I learn huge amounts from other community contributors and it’s wonderful to play my small part in that and be recognised with this prestigious award for that work. It’s a little intimidating too, to be joining such an expert group of fellow MVPs. I can’t help but feel a degree of impostor syndrome at the thought. I hope to live up to the award by continuing to contribute within the community. I want to keep up blogging, speaking, running my user group and OSS contributions as much as possible. There are a few other projects and ideas that I hope to find the time to do also that I hope will contribute further to the ASP.NET community in particular. I owe a huge thanks to the community and various specific people along my journey who have supported what I’m doing, offered advice and nominated me for this award. A big thanks to everyone who has helped me along the way!